Got A Goal To Grow Your Practice This Year? Let's Get Real. I want to get real with you. Because I want you to succeed. This is the year to embrace your role as an entrepreneur and grow your business into a unique and profitable machine. That means looking at your business in a totally new way. Here’s an area you need to prioritize: Write killer copy for your website that doesn't blend into what everyone else has on their websites. Most therapists write website copy that does a mediocre job of converting visitors into clients. If you improve your conversion rate even just a tiny bit, it will make a big difference in filling your practice. When you turn more visitors into clients, you increase your income substantially, even before you increase traffic to your site. We’ll start with your About page. It’s probably the hardest page on your site to write, and it’s one of the very most important. Next week I’ll share my new free training on how to create a better About page. I’ll provide step-by-step instructions on how to write and edit your About page in a way that helps your right-fit clients decide to hire you. So you don’t have a lot of money to invest, but you really want to start your private practice NOW? Or maybe yesterday? I’ll show you how to bootstrap it. When you bootstrap, you pay for the expenses of your practice with the money your practice earns, and you invest more as your business makes more. I’ll walk you through 3 phases of launching and growing your private practice to the point where it can support you. I'm assuming you’ve already got some decent clothes to wear, a computer, a phone, and another way to pay your living expenses as you get started. Maybe you've got a part-time job or a spouse with some income. Unfortunately, it’s unavoidable to spend SOME money before your practice starts paying for itself. You’ll want about $500 to $1000 saved before you start, and I’ll show you why. Don’t have that $500 or $1000? How badly do you want to do this? Get ready to do an inexpensive vacation, brown-bag your lunch or shop at thrift stores until you’ve got it. If private practice is your dream, you can do it. Here are the steps to get started, starting with the ones that won’t cost you any of your seed money. Even before you launch, you will can start networking. Implement my challenge 30 Days To A Strong Referral Network for a free and effective way to bring in your first clients. The only cost is the lunch or coffee you might buy for a colleague. Some therapists use their cell phones with a professional greeting. Others use google voice or another . Note: If you’re concerned about HIPAA compliance with your phone or other private practice technology, do a little research. First find out whether or not your particular practice needs to be HIPAA compliant. If you have questions about HIPAA and technology, check out tameyourpractice.com. Rob Reinhardt has tons of free resources there about technology and private practice. If you want to pay for some of his advice, he can save you hours of research time. I paid for his advice myself when expanded my practice. You can offer video sessions for free if that’s something you’re trained to do by signing up for a free video platform. New platforms are showing up every month so stay up-to-date here. Open a separate bank account for your practice, and make sure it’s free. If your business is a sole proprietorship? That's the default when you're the only owner of a business that's not incorporated. Then you don't have to open a special account that the bank labels a business checking account. Just don't mix your practice account with your personal accounts. Get set up to accept credit cards. Create an account with a service like stripe or square, where you can store your clients’ credit cards safely. They’ll take about 3% of the charges, but there’s no fee to set up. It hurts a bit to give up those processing fees, but the convenience makes up for it. Who carries checks anymore? Set up a separate email account for your business. Start here for hours of training for absolutely free. If you like listening instead, start with my podcast. Set up a profile for free. This is a really important step. Don’t skip it. Choose a directory that shows up close to the top of the first page of google when your right-fit potential client is searching for a therapist like you. See if you can get a free trial through your professional organization. Before you’ve got a website, directories are the main way you’ll get people searching online to call you. Have a friend with a good eye take a warm and professional photo. You’ll need this for your directories. I will strongly advise you to get a professional photo taken as soon as possible. For now, please make sure there are no shadows on your face, and look at the camera as if it is one of your favorite people in the world. This is free, and you should get one now if you don’t already have one. You’ll want this for tax purposes and it allows you to NOT use your social security number on the receipts you give clients. You’ll set up tracking for the most important things in your business so you always know what’s going on. Here’s my article on tracking. Set up a few simple systems now, and you’ll kiss yourself next April. Here’s my article about prepping for taxes year round. Hey, you haven't spent any money yet, and look how much you've accomplished! If you’ve got a colleague who will rent you some space by the hour in the beginning, that will save you even more. One day a week will cost you about $300 per month or less, depending on where you live. If you don’t live in an expensive place like San Francisco or New York City, give yourself a high five right now! Unless you are very tech savvy, start with a DIY platform. I recommend Squarespace because they are better than other DIY platforms at keeping up with changes and their customer support is excellent. A Squarespace site will cost you around $12 per month. When you've got a bit of savings, I'll recommend that you consider working with a designer and perhaps using Wordpress instead. (Although this site is Squarespace so maybe not). For now, just create a simple and professional-looking site with just the basic pages (Home, About, Services (or Specialities), Contact/Fees). OK, so the website sounds simple! Here’s the catch: writing the copy (words) for your website isn’t that easy. It will take you some serious work and patience to make the copy good enough to attract your right-fit clients. Start writing during phase one using advice from my blog, and you’ll be in great shape. Here are instructions about how to write ridiculously effective copy. Here’s my free training on how to create an excellent about me page. Now that you’ve got your site, you want all of your potential clients who find you online to go to your website. That’s the best place for them to learn more about you and then decide to call you. Depending on where you live, this will cost you around $100 or less. It will cost you somewhere around $150 or up to have decent protection. Get a quote for free. It will cost you less than $50 to get some simple business cards printed. Don’t get too many because your address and other information will probably change soon. So far you’ve only spent about $648. Most of that is rent, so if you find a better deal on that, your number can go WAY lower. To make back your seed money you’ll need somewhere between 3 and 7 sessions in that first month. If you’re highly motivated and put time into the networking or you’ve already got some clients ready to start, that can totally happen. If you’re limited on practice building time or energy and have no clients to start with, set aside an additional month’s rent and other expenses. That’s why I gave you the range of $500 to $1000. Once you’ve recovered your seed money and you’re exceeding your monthly business expenses, start saving up for some key things to build your business. Usually you can start saving when you have four or five sessions per week. Here are the things you should spend your money on during this next phase. If you do all of them, you’re looking at under $4000. Get your professional photo taken. You may want to budget $500 so that you can choose the best photographer. If you find a photographer you LOVE who charges less, you can get this done sooner. By now you'll know whether you're rocking that DIY website and making it great OR you could use some help. Consider working with a designer who understands the particular needs of therapists. Empathy sites is one great, trustworthy option. If you’re getting full with the office space you have now, sublet an additional day, even if it’s at a different location. Having a profile on one more directory will increase the odds that your right-fit potential clients will find you online. Look for the kinds of clinical trainings that inspire you the very most and can give you the skills you and your clients value. Invest in reputable and life changing training, even if it costs a bit more. Speed up your journey by taking a course that teaches you marketing and business management skills and pushes you to actually USE those skills right away. Do this as soon as you can afford it so that it doesn’t take you years to make a good living. When I run my Superpower Method For Therapists® Program, the beginners often find that they avoid a lot of mistakes and gain clarity about their businesses quickly. Participants who have been in private practice for several years often say they wish they’d taken the course earlier. Pitch yourself to the organizations where your right-fit clients hang out. Did you just throw up a little? Ok, just consider it. As your practice grows this will help you stay organized and keep your time and energy focused on the right stuff. There are tons of systems to choose from. Find reviews of almost all of them at tameyourpractice.com. If you’ve been networking strategically and steadily and your website is attracting the right clients, your business bank account should start growing. You’re on track to quit your day job and start paying yourself from the income of your private practice. This usually happens when you’ve got between 10 and 15 sessions per week. Phase 3: Making a GOOD living. Phew! Ready to take your practice to the next level and invest some more? Consider finding other ways to serve your right-fit clients. Consult with a business coach as you identify your ideal business model. Maybe you'll begin offering group or online services if you aren't already. Maybe you'll bring additional clinicians into your practice. Check out my program, Rebel Therapist™ Mastermind. It’s not for everyone, but you’ll probably know if it’s for you. So that’s bootstrapping a private practice all the way from scratch to making a good living. Ready to make some serious progress towards growing your practice in the next 30 days? Networking is the fastest way. Sign up for this free challenge and you'll receive 30 days of do-able tasks. You'll also receive weekly tips on how to build your practice. Easily unsubscribe any time. Tons Of Great Ideas? Unclear On Where To Start? Bianca Hughes had been in private practice for two years, working too much for not enough income. She had tons of great ideas but felt unclear about where to start. Register for the program now. Registration closes on Friday, August 25th. Tom Bruett was just two months into private practice when he enrolled in the Superpower Method For Therapists® Program. As he says, “Before starting the program, I didn’t have a business plan, niche or budget.” He accomplished more during the 14 weeks of the program than most people accomplish in a year. If you’re ready to make 2017 the year you find focus and turn your practice into a phenomenal business, please join us. Learn about the program and register. Registration closes on Tuesday, February 7th. Here’s a beautiful before and after story. A few months ago, Ellie Vargas lacked focus in her business. She felt as if she was making it up as she went along. She was doing what a lot of therapists do: providing excellent therapy and neglecting the business side of her practice. Ellie’s "before" scenario is really common. If you’re lacking focus and making it up as you go along, you’re SO not alone. Let’s look at why this happens to so many awesome therapists. Why do so many therapists (like you) lack focus for the business side of private practice? You weren’t taught the basics of business and marketing in your graduate program. When you don't know the steps to building your business, you can feel scattered and ineffective. You don't nurture your inner entrepreneur. When you start a private practice, you’re suddenly an entrepreneur. Developing an entrepreneurial mindset is as important as learning business skills. Your inner entrepreneur can give you the resilience and vision to work through the ups and downs of owning your own business. Creating a solid business and marketing your practice often fall to the end of your to-do list. Clients come first. Then there’s paperwork. Then there’s your personal life! If there’s no due date attached to it, you sometimes just don’t do it. My Superpower Method For Therapists® Program is designed to help you get to the other side of all of this. You'll know how to build and maintain a solid business. I’ll guide you to create a plan tailored to your strengths and the needs of the clients you work best with. You'll tap into your inner entrepreneur. The exercises in this program are designed to help you get creative about your business and try out new possibilities. You'll set aside the time for 14 weeks. This program is set up with deadlines every two weeks. Many participants have found that the structure and accountability helped them get more done than they thought they could. Signing up for the program is a commitment to yourself and your business. As Ellie said, “I wasn’t going to squander this investment,” and she sure didn’t. Registration for this program opens up on Tuesday, January 24th. Sign up below and we'll remind you when it's time. Your goal is to fill your practice with more full-fee clients. All of your sliding scale or insurance slots are full, and you’ve figured out that with five or ten full-fee clients, your business would be way better off. Potential clients don’t contact you often enough, and you’re feeling discouraged and frustrated. You’re pretty sure if you keep on doing things the way you have been, your practice won’t be in a significantly better spot by the beginning of 2017. It just takes time. You need to wait for clients to find you. Your colleagues will get to know you better, your work will keep on improving, and eventually you’ll have a full practice. When you wait and hope to build your business without strategy or intention, you don’t create the businesses you really want. You burn out because you end up working too much and not doing enough of what you’re great at. In this 5-day challenge, you'll identify a plan to bring in more of the full-fee clients you want to work with, and begin taking steps using that plan. We'll kick off the challenge with a live online workshop on Monday, November 14th at 10:00 am PT, 1:00 ET. During the live workshop, I’ll walk you through the Free 5-Day Challenge and answer your questions. If you can’t make it live, you can watch the recording. You'll receive it later that day. Day One: Choose your next 10 clients. This is a short exercise to help you clarify your focus. At the end of this step, you’ll be able to identify who you’d like to bring into your practice and you’ll have some keys to reaching those people. Day Two: Brainstorm ways to help those next 10 clients find you. The possibilities are overwhelming, but your best marketing strategy includes a small number of activities done well. Today, you'll brainstorm and tomorrow you'll choose the best ideas based on who your right-fit clients are, what your strengths are, and what you don't hate doing. Day Three: Design your flexible marketing checklist or grab bag. You’ll create a plan you can follow and adjust. With a marketing plan, you don’t have to waste any more time sitting in overwhelm. Day Four: Take one networking step. Based on your marketing plan, you’ll take one important step to start bringing in your favorite clients. Day Five: Take one step to improve your online presence. You’ve got your flexible checklist or grab bag at this point, and you’re going to choose one key step to help your right-fit clients find you online. This challenge is NOT going to fill your practice in 5 days. We both know that’s not gonna happen. It’s not a blueprint. I SO don’t believe those work. I’ll give you a path to create a short-term plan tailored to you and your right-fit clients. This is a choose your own adventure story. This isn’t a boot camp. I’m giving you small assignments you can complete in 30 minutes or less per day. If you’ve got extra time, you can always do more! Sorry, this challenge has already started! Sign up below so you don't miss the next one. You’re emotionally present for your clients every day, and that takes a lot of energy. It’s an incredible honor to step into your clients’ lives and witness their vulnerability. You’re responsible for practicing self-care so that you can be a great therapist. When you’re burned out and exhausted, you’re...less good. Part of your job is to take time off. Vacation is not a disruption in your private practice. It’s a normal part of the rhythm of your work. Time off, just like sleep, is a necessary and regular part of your life. When you treat vacation as a disruption to your private practice, you don’t get its full benefits. Most therapists are handling vacation all wrong. Here’s how it’s supposed to work: you look forward to vacation, leave work behind when you go, take enough time off, feel well rested when you return, and then ease back into work. 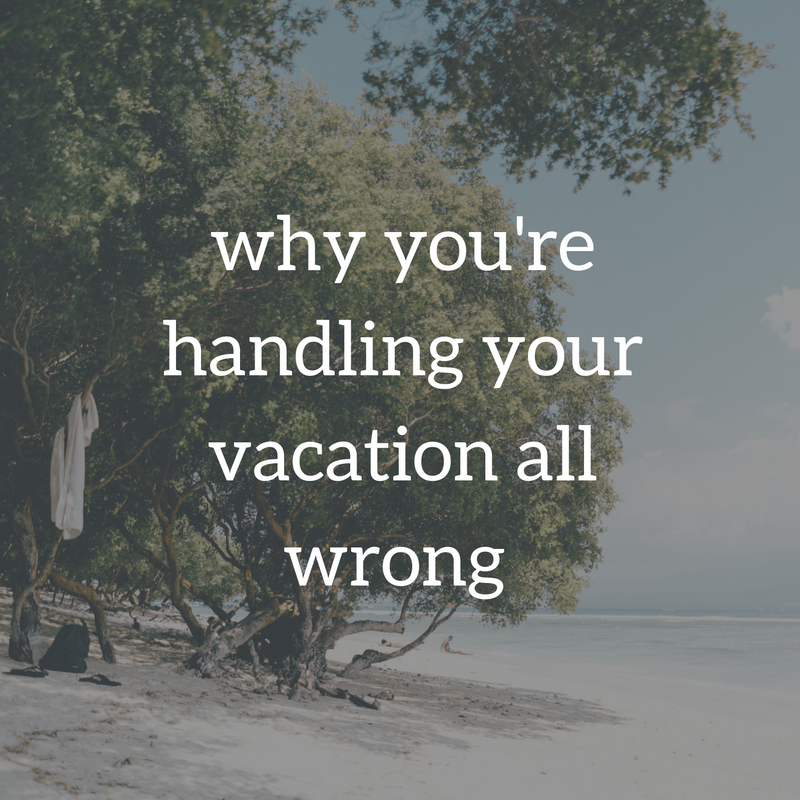 If you’re not handling vacation this way, read on. 1. DON'T double up on sessions in the week before you leave or the week you return. When you try to make up the sessions that would have happened during your vacation, you’re setting yourself up to be too busy before you leave and too busy when you return. That’s stressful, and it doesn’t count as vacation. If you’re working with a client who shouldn’t take time off of therapy, you need to establish a backup therapy relationship right now, before it’s time for your vacation. In most cases in private practice, it’s appropriate for the client to miss those sessions. If you’re uncomfortable taking time off without doubling up before and after, you might need some consultation so that you can sit with your clients’ feelings. Maybe the financial impact of vacation brings you discomfort. That brings us to the next guideline. 2. Build time off into your financial plan. When you calculate the amount you need to bring in every month, account for the weeks when you’ll take time off. Make sure your fee and your number of sessions per week set you up to be able to take vacation without financial distress. 3. DON'T wait until you can afford an amazing vacation. Staycations are great too. If you can’t afford to go away, take time off anyway. 4. If you go away during your time off, take one more day off at home before you go back to sessions. This is a great self-care tactic. Take a day to recover from jet lag, unpack, or just get caught up on paperwork and email before you step back into the therapy room. 5. Set up your time off well so that you can really relax. Give your clients ample notice that you’ll be away. Ask a colleague to be available for your clients if they need to talk to a therapist before you return. Create and record an outgoing voicemail script stating when you’ll return, what to do if they are a new client who wants to work with you and what to do if they are already working with you and need to speak to someone. Set up your email to automatically respond with your backup therapist’s information and your return date. The day before you go, give yourself at least an extra hour to tie up loose ends. In that hour, respond to emails from clients and potential clients, and quickly email anyone else waiting for a response from you that you’ll be away and won’t be able to respond until you return. Make a list of what you’ll need to do on your return day. You’re in a better position before you go to write that to-do list, and you’ll avoid feeling overwhelmed when you return. 6. Allow yourself to return slowly. Remember that it takes a few days to catch up completely. If you took my advice and didn’t overbook yourself for the week of your return, you’ll have enough time to catch up on email and voicemails within a few days. 7. Take enough time off. Do you ever take more than a week off? You’ve got to go through all of the trouble of getting prepared for time off. Take as much time as you really need so you can completely let go. 8. Schedule your next vacation before you take this one. Schedule some time off every few months. Don’t wait until you feel burned out before you plan your time off. Consider planning out your vacation time for the next year. Looking forward to pleasant events gives us as much happiness as the events themselves. Ready to take some action to bring in more clients? Click below to start the challenge. Financial therapist and author Bari Tessler shares important tools for therapists in private practice.